1 - pair/s $6.95 ea. 4 - pair/s $5.95 ea. 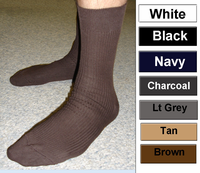 Your feet will love these medium weight exceptionally soft and comfortable award winning Wigwam crew length socks. Ideal for sport and casual wear. 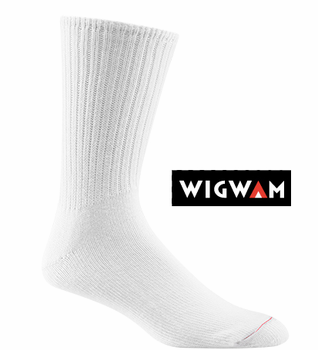 These are the Original Wigwam Cotton Sport socks that are made from the finest 100% cotton ring spun cotton (exclusive of the tiny elastic from rubber in the very top of the sock, not lycra that many people are allergic to and have problems). Please Note: these socks contain a very small amount of rubber elastic at the top of the sock that is covered with 100% Cotton to keep the sock from falling down. These socks provide maximum absorbency, wear, and the ultimate in comfort! Color - white. Machine wash and dry. Quality made in the USA! Wigwam Masters style number F1061, now also in the color black. New! Shoe size 13.5-14.5 in color white! "Excellent. I have been telling all my friends how much I love these socks. They even keep their shape unlike other cotton socks. They are very comfortable and wash beautifully. 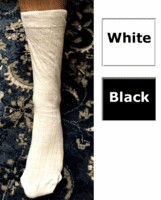 Follow-up was immediate telling me you got my order and socks arrived on time as promised."